It’s 8pm on a week day night, you’re exhausted from the looong work day, dinner is done, dishes are put away, you finally have some relaxing time before bed and you are hit with this insane craving for warm, homemade, cookies! You’re so tired you don’t even want to get up from the couch and gather all the ingredients to whip up a batch of cookies. But…this craving…it won’t leave you alone! 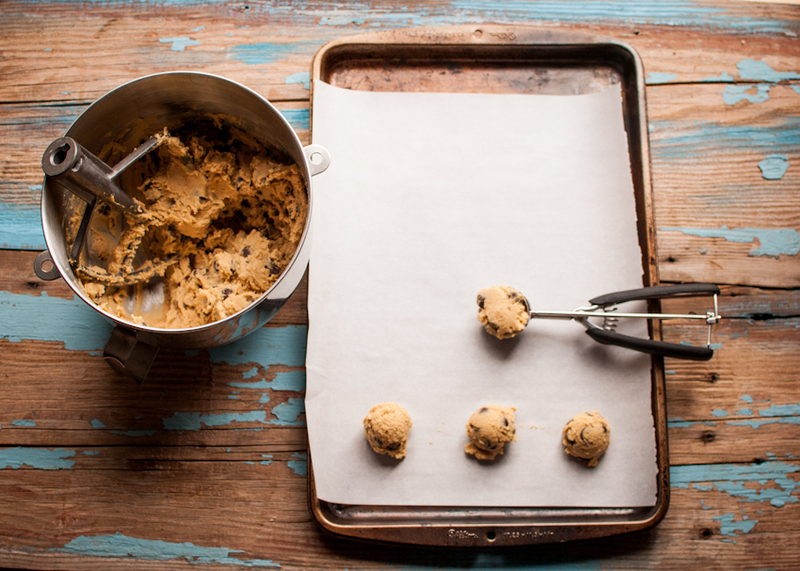 I have the perfect solution to this late night craving….. homemade frozen cookie dough! I know, it’s probably been done… no, wait- it HAS been done before, but I’m sure many people don’t think much about doing it. This idea came about at the end of our summer garden and I had all this extra zucchini to deal with. I can’t throw it out, and I’ve already exhausted the neighbors and friends with free zucchini. Andrew suggested I freeze my cookie dough. He loves my zucchini cookies…I mean looooooves them a lot! And what better way to enjoy them year round in the winter when it’s cold and frozen out in the garden. Easier than you think…. Mix your favorite cookie recipe and with a cookie scooper, scoop out onto parchment lined cookie sheets. Put these in the freezer for about 30 minutes, or until frozen. Then place all the frozen cookie balls in a ziplock freezer bag. When that crazy homemade cookie craving comes on, take out as many or as few as you want to bake. Thaw them on the counter then bake in the oven! This really comes in handy during the work week when ours days are already 15 hours long. I usually pull some dough out of the freezer before making dinner, then pop them in the oven when dinner is done. Voila! oh I so know what you mean.. us too! I LOVE COOKIE DOUGH. That is all I have to say about that. I know right Kayla! Best thing since chocolate and PB! I love freezing cookie dough! It is so amazing to always have some on hand for when a craving strikes or when you have unexpected guests!